The farmers market is in full force here in Omaha and I absolutely could not pass up the opportunity to bring home a few lovely peaches. 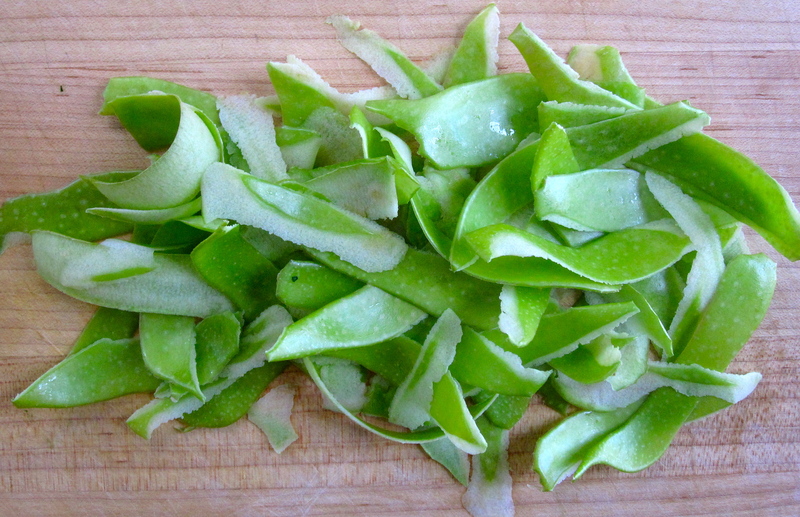 As they sat on my counter, I thought about what I might do with them besides just slice and eat (which is perfectly fine). I ran across a few inspirations online and decided to sort of mash them all together and add a few of my own ingredients. If you’re like me at all, you have a collection of overripe bananas in your freezer, destined for bread. I have a pretty fool-proof (and delicious) recipe for banana bread given to me by my mother, but I wanted to change things up this time around. And what better way to do that than with chocolate? 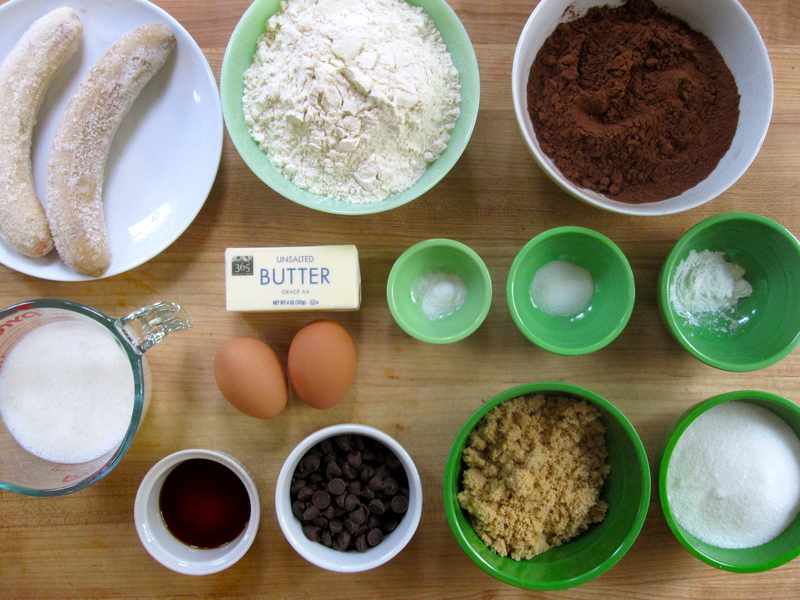 I was reminded of a batch of chocolate-banana ice cream I made for my friend Matthew as a Christmas gift. I asked he and his wife, Sarah, what their favorite flavors of ice cream were, and that is what I gave to them as gifts. I much prefer giving edible gifts over anything else for holidays and birthdays. Matthew said he loved the combination of chocolate and banana, and I totally agree. Why not turn that into a bread? The bananas (minus one) are still a little frozen in this photo, my apologies. I was hoping for a bread that was more dessert-like in texture, and I think this was a success. 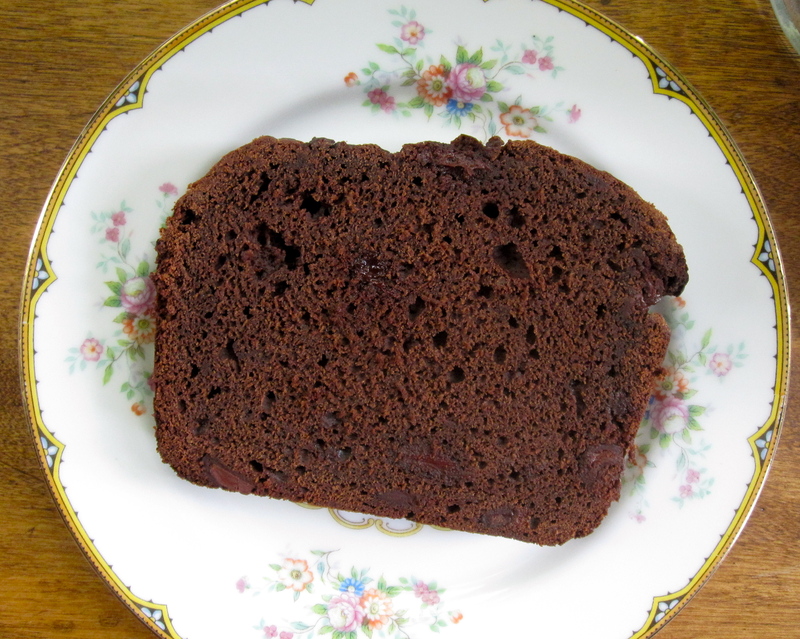 It had the dense consistency of pound cake, and the banana flavor was just subtle enough not to be overpowering. However, I would probably omit the chocolate chips in my next batch of this bread. I say this only because (as you might know if you read this blog) I don’t prefer overly-sweet dishes. The chocolate powder was perfect on its own and needed no extra help from the chips. 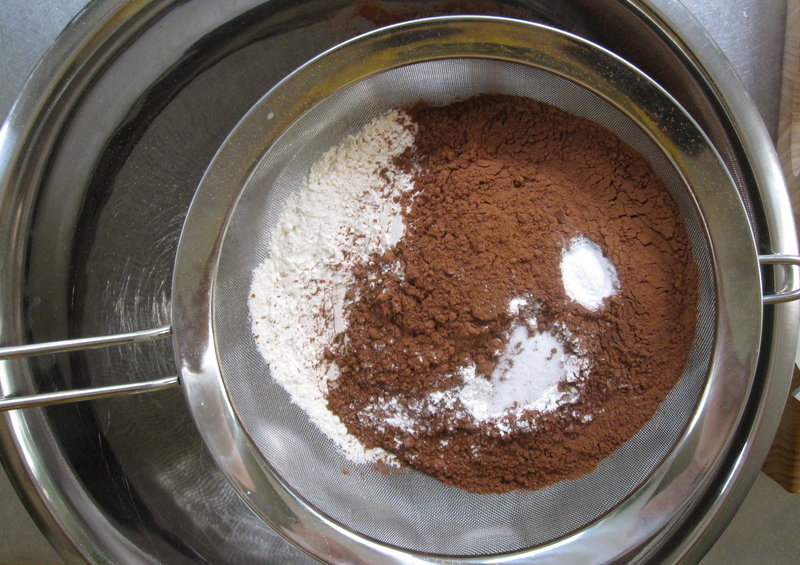 All-purpose flour sifted with cocoa powder, granulated sugar, baking soda, baking powder, and salt. If you’ve followed this blog at all, you know that I have a special place in my heart reserved for America’s Test Kitchen and Cook’s Illustrated Magazine. Last April, I was chosen as a finalist for their “Learn To Cook” series. Alas, I did not win, but I still love them and put my full trust in their tried-and-true recipes. What I love so much about their recipes is that they test out many different methods, using many different ingredients until they settle on the “perfect” way to do something. This cake is no exception. Normally, when one thinks of an upside-down cake, images of juicy rounds of pineapple studded with shiny and saccharin-sweet maraschino cherries come to mind. But this one is different in so many wonderful ways. As the saying goes, “Imitation is the highest form of flattery.” Now, I would never claim to have the culinary skills of the venerable Julia Child, but hey, I can imitate, and that’s good enough for me. I know, I know, you’re probably thinking, “Sara, we’ve already seen Julie and Julia, we don’t need to read about your misadventures in cookery.” But hear me out. I promise I won’t take you down a self-reflective road of discovery on my way to inner peace; I just want to tell you what I did last weekend. That’s all. My very good friends, Sarah and Matthew, are part of a roaming pot-luck group and it was their turn to host last Sunday. 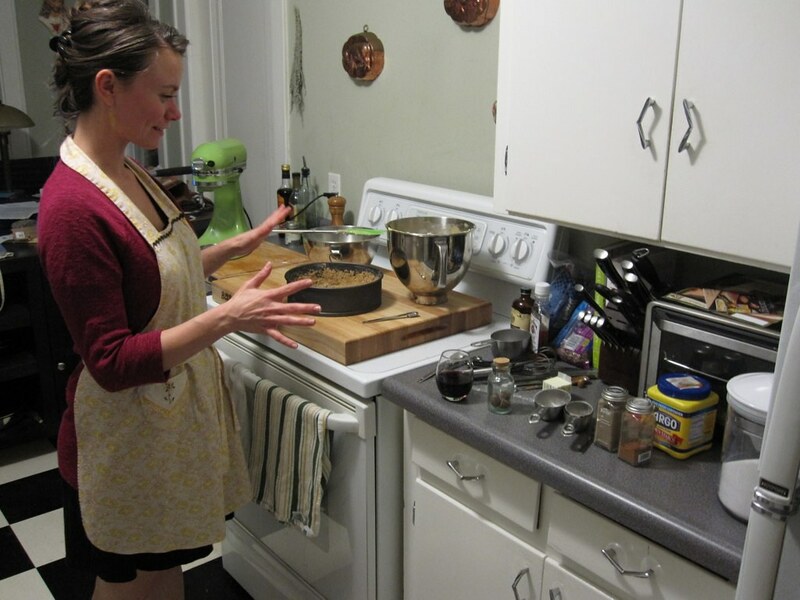 Sarah is a food writer for our local paper and also maintains a blog. She pointed out to me that Julia Child’s 100th birthday is on August 15th, and she wanted to have a celebratory pot-luck in honor of her; all items were to come from Julia’s own cookbooks. I thought it was a fabulous idea, and I was instantly rolling recipes around in my head in preparation for the Big Night. 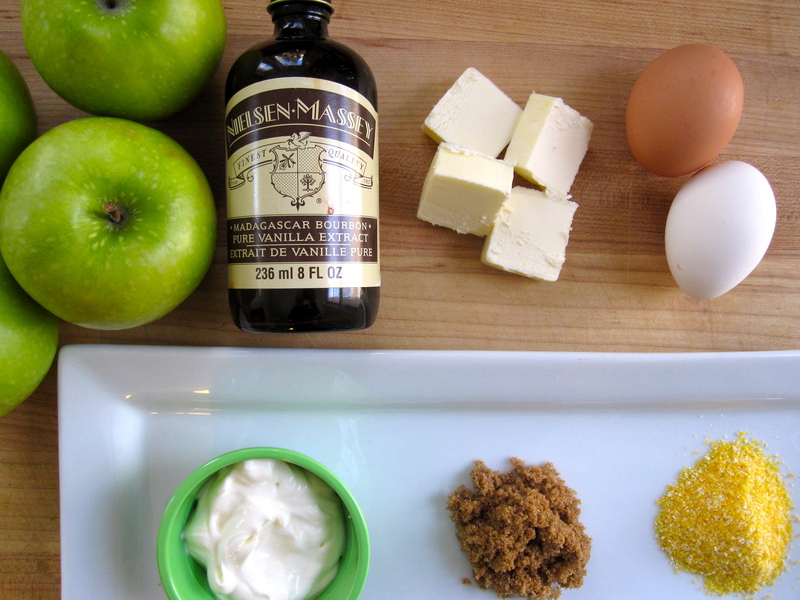 All the makings of a perfect tart crust. Okay, so it’s pretty widely known that although I thoroughly enjoy baking and making desserts, I don’t possess a very distinct sweet tooth. I have never been one to get too excited over a box of chocolates or squeal with delight at the sight of a dessert menu. I prefer salty over sugared. Savory over cloyingly sweet. However, I’ve really never been able to say no to pie. I love pie. 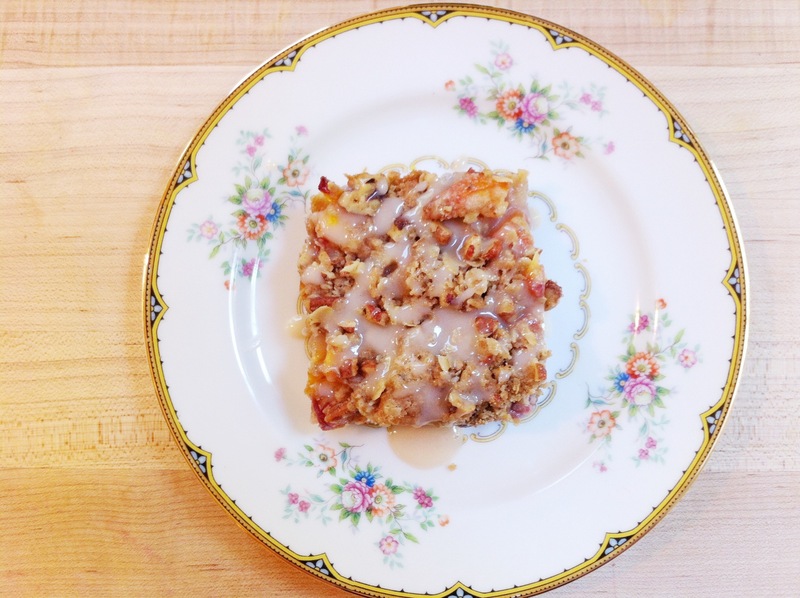 The flaky crust, the sweet (and sometimes fruity) filling that spills out onto the plate. Ice cream? No, thank you. I’ll take my pie on its own. Just a fork, please. 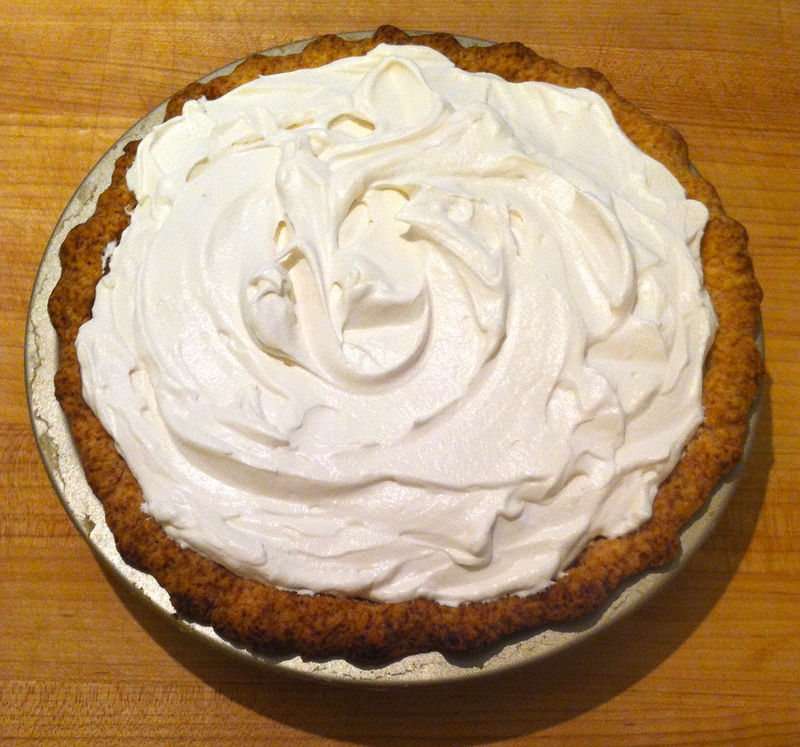 But lurking behind that lovely and delicious slice of pie is a problem not easily solved if one gets too flustered. The problem, you may ask? Why, the crust itself, of course! It’s only pie if there is a crust. And making the crust can seem like an insurmountable obstacle to the novice cook – heck, even to the seasoned foodie. Perhaps you’re thinking, “Sara, it’s just crust. How hard can it be? Flour, butter, sugar, water…what’s the big deal?” The big deal, people, is the fact that the crust could potentially make or break a pie. 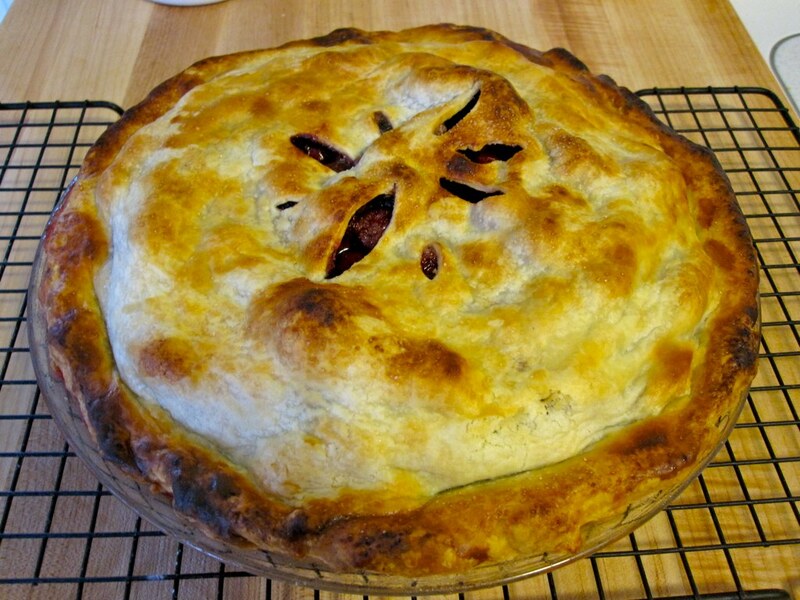 It holds the pie together, so it must be substantial, but nobody wants to eat a dense and doughy crust. They want flaky, light, and buttery. Of course! So simple! No, it takes diligence, practice, patience, and the right temperature of ingredients. Now, my Scratch Cherry Pie (crust) recipe calls for shortening. I dislike commercial shortening a great deal. I prefer lard. Yes, lard. If you’re able to find it, buy some, put it in your freezer and it’ll be there, patiently waiting for situations like this. I just so happened to have home-rendered lard in my freezer. 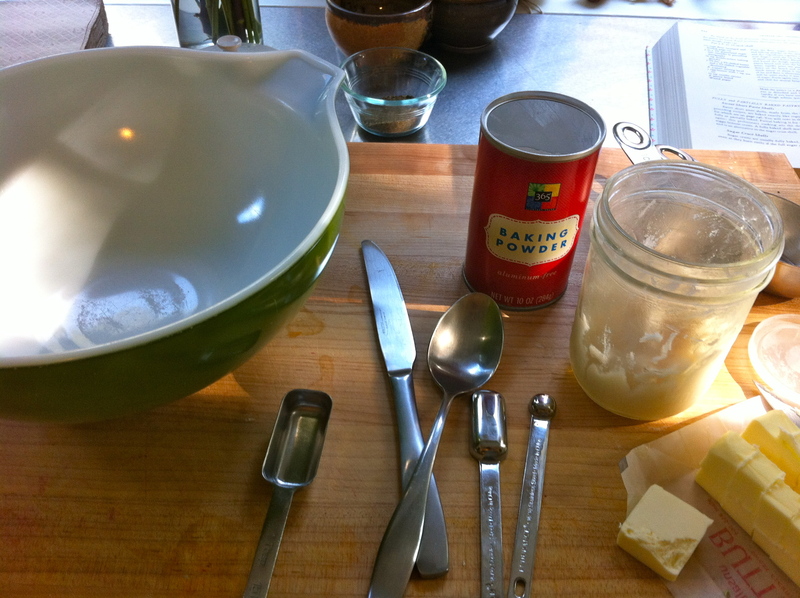 Make sure your butter and lard are very, very cold before you get started. Pop them both in the freezer for 10 minutes if you have to. The key to flaky crust is cold butter. 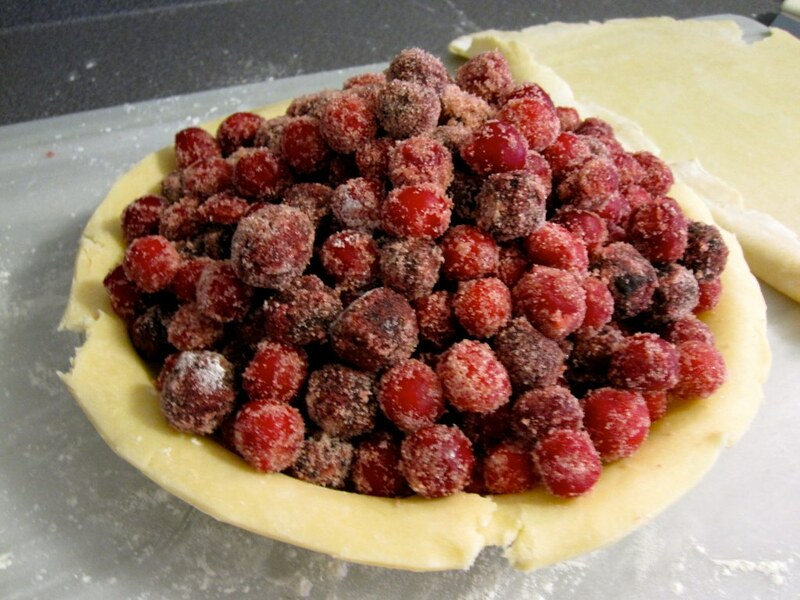 If it’s cold (and you keep it cold) throughout the process, when the pie bakes, the water will evaporate from the butter and create a light, flaky crust. Just what you want, right? If you don’t have access to a marble board (which helps to keep the whole shebang cold), and you find your dough becoming warm, just pop it back into the fridge (or freezer) for 5 minutes or so to get the chill back. Then continue on as if nothing ever happened. Nobody’s watching. It’s just you and the dough. Do what you want. As for the cherries, I use a mixture of frozen red tart and dark sweet cherries. Yes, frozen. Since cherry season in the Midwest is practically over the second it starts, frozen is the way to go, at least in Nebraska. If you can afford it, invest in a marble pastry board. You’ll use it, trust me. For pastry, pasta, bread dough, etc. If you have marble or granite counters, well then, you’re set. You don’t need anything extra. Pick up a pie crust shield. It’s necessary and making a shield out of foil isn’t the easiest thing in the world. Besides, you run the risk of burning yourself trying to mold it to your pie. Lard and real butter, cold. Enough said. In a large bowl or food processor (my preferred method) blend together the flour, butter, lard, and salt just until the mixture resembles coarse meal with pea-sized lumps of butter going through it. Drizzle 5 tablespoons ice water over mixture and pulse (or stir with fork) until incorporated into flour mixture. If you squeeze a small handful of dough and it holds together, you’re good. If not; if it seems too dry or sandy, add more water, 1 tablespoon at a time, until the dough is able to hold together. Don’t go crazy with the water or the mixing at this point. It’s important not to overwork the dough. If you do, your butter and lard will begin to melt and we don’t want that. We want cold, cold, cold dough! Turn dough out onto your board and gather with bench scraper. Divide dough into 4-6 equal portions and with the heel of your hand, smear each portion once or twice in a forward motion to equally distribute the fat. Gather it all together with the scraper. Divide dough into two portions, one just a little bigger than the other. Form into ball and then press each gently into a disk. Wrap tightly in cling film and chill in the fridge until firm. I usually let mine chill overnight, but if you’re anxious, leave them in the fridge for at least an hour. Preheat your oven to 425ºF and place a baking sheet on middle rack. Finely grind the tapioca in the grinder or mortar and pestle. In a large bowl, whisk together ground tapioca, cornstarch, cinnamon, ginger, cardamom (if using), salt, and sugar. Add cherries, vanilla extract, and Grand Marnier or bourbon (if using alcohol). Toss well and let stand for 30 minutes, tossing a few times to distribute sugar. Remove the larger of the two dough disks from the fridge and let sit on your marble surface (dusted with flour) for a few minutes to take the chill off. 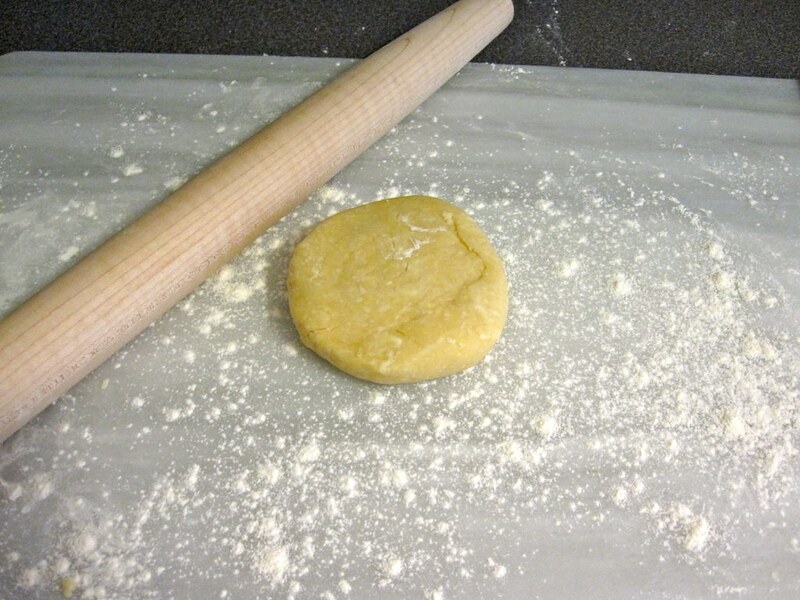 Roll with a lightly floured rolling pin into a 14-inch (approximate) round. Fit into a 9-inch pie plate. Trim off excess dough to leave a 1/2-inch overhang. Chill shell while rolling out top crust. Roll out remaining dough to a 12-inch round (approximate). Toss cherries again and add them to the shell and cover with the top crust. Press the edges together, trim, leaving a 1/2-inch overhang. Fold overhang under and press. If you feel the need to decoratively crimp the edges, feel free. I just press them together in a “rustic” fashion with my fingers. Brush top crust with milk. 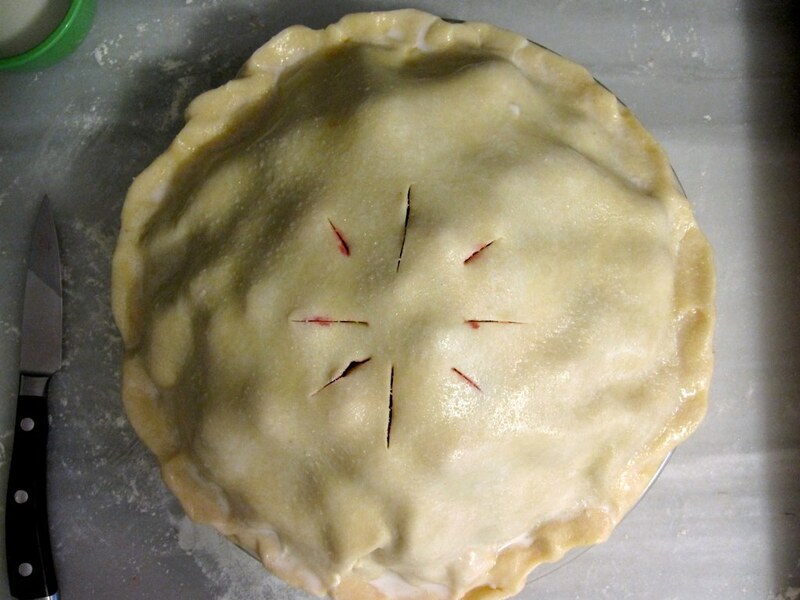 Make a few slits in the top of the pie to allow steam to escape. Sprinkle pie with granulated sugar (approx. 1 tablespoon). Bake pie on preheated baking sheet for 30 minutes, then cover edges with a pie shield or foil and reduce the temperature to 375ºF. Continue baking until crust has a golden brown color to it and the filling is nice and bubbly in the center, 50 minutes to 1 hour more. Transfer pie to a rack to cool completely, 3 to 4 hours. Last night I chose to tackle a cheesecake for the Thanksgiving dessert. 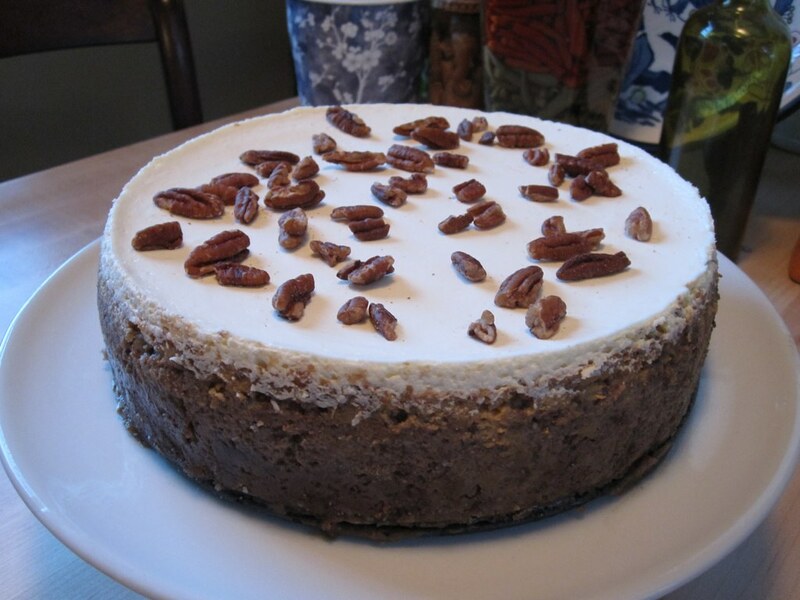 Now, understand this: I love making cheesecakes, but I find them to be too rich for my taste. The funny thing about me, I suppose, is that I lack the requisite sweet tooth for most desserts. I find a lot of joy in the specific measuring of ingredients, the sifting, the mixing, the high heat of the oven – but I prefer to share (…ahem, force) the end product with others, rather than eat it on my own. I scoured the Internet and my cookbooks, and came across a lovely sounding pumpkin cheesecake recipe on one of my favorite blogs. Deb is a woman after my very own heart – putting bourbon in just about anything she can! Oh my! I made a few changes to her recipe along the way. For instance, I did not invert the bottom of my springform pan (because it wasn’t snug) and I chose to pop the crust into the freezer for 45 minutes, rather than in the fridge for an hour. I also chose to halve the amount of fresh nutmeg and replace the other half with ground cardamom. I love the subtle floral and citrus notes that ground cardamom can give to a recipe, especially when paired with cinnamon and ginger. It sort of hangs out in the background of the dish, just waiting to be identified. I also went with dark brown sugar rather than light because I love the depth of flavor that darker brown sugar adds to desserts. I decided to bake my cheesecake in a water bath, because I have found this helps it to bake evenly, especially since I have a geriatric oven residing in my kitchen. After about an hour, I carefully removed the cheesecake from the oven and allowed it to rest while I mixed together the topping. I was a little more heavy-handed with the bourbon than what was called for, but hey, what can I say? I like a little hooch with my desserts. I popped it back into the oven (minus the water bath) and left it there for an additional 10 minutes until it seemed as though it would spill right over the edge. It placed it on the counter to cool for several hours and now it is chilling in the fridge awaiting the big day. Butter the bottom and sides of a 9-inch springform pan. 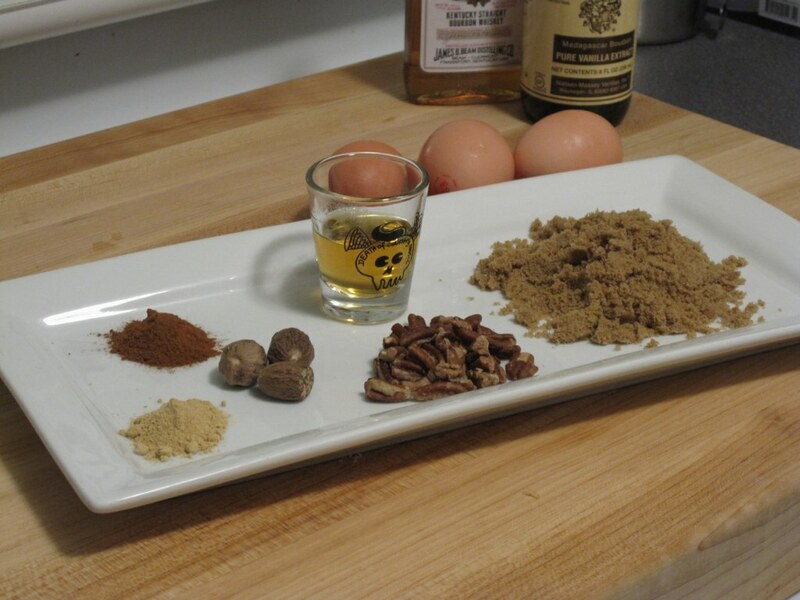 Stir together the crumbs, chopped pecans, sugars, and butter in a bowl until combined well. I found my hands worked best for this job. Press crumb mixture onto bottom and 1/2 inch up side of pan. I used a small juice glass with a flat bottom to help me press the crumbs into the pan. Chill the crust in freezer for 45 minutes or in the fridge for 1 hour. 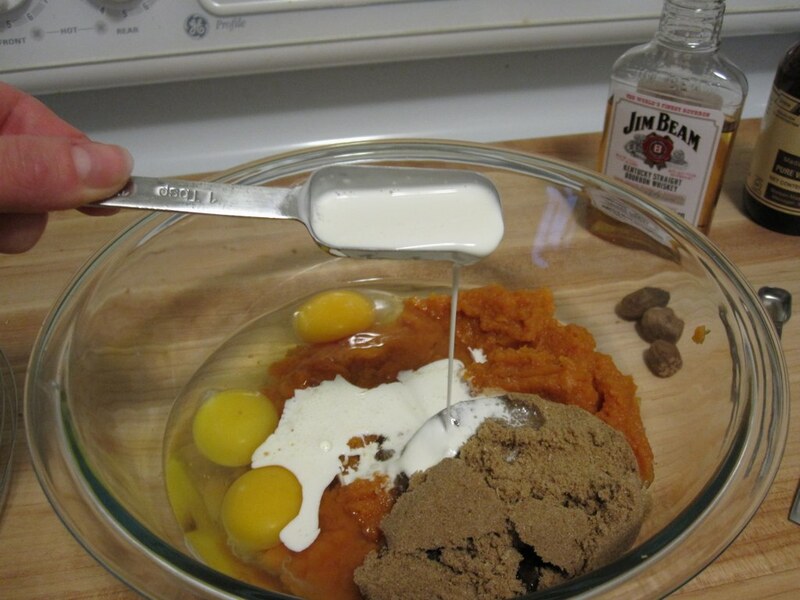 In a medium bowl, whisk together the pumpkin, eggs, brown sugar, cream, vanilla, and bourbon (if you choose to use it). In a large bowl (or the bowl of your stand mixer), stir together the granulated sugar, cornstarch, cinnamon, nutmeg, cardamom, ginger, and salt. 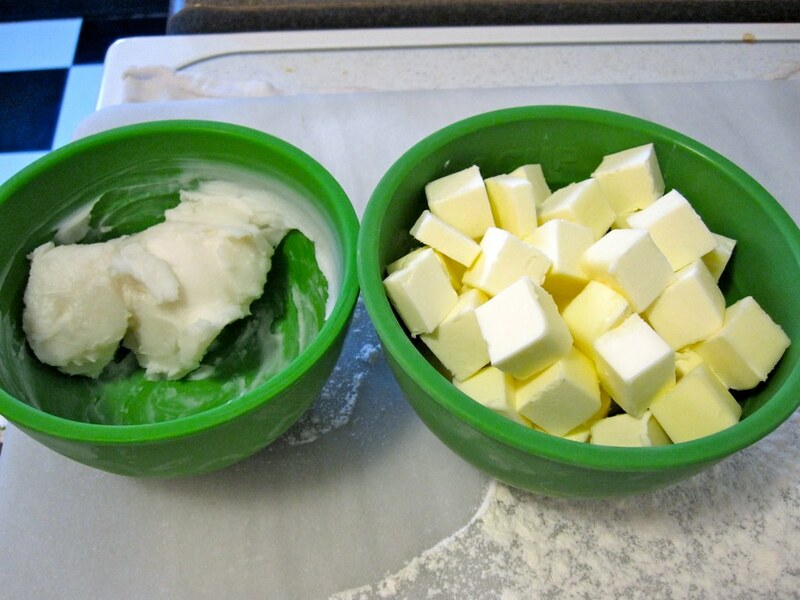 To that bowl, add the cream cheese and beat with electric mixer at high speed until creamy and smooth, roughly 3 minutes, stopping to scrape down the sides of bowl. Lower speed to medium, then add pumpkin mixture and beat until smooth, stopping once or twice to scrape down the sides of bowl. Pour filling into crust, smoothing top, and then put springform pan into a large roasting pan. Fill roasting pan with water until it reaches halfway up the side of the springform pan. If you don’t have a large enough roasting pan, simply place the springform pan on a baking sheet. Carefully place onto middle rack of oven and bake until center is just set, 55 minutes to 1 hour. You’re looking for a jello-like wiggle when you jiggle the pan. Transfer to rack and cool 5 minutes. Leave oven on. I took mine out of the water bath to cool and poured out the water. Whisk together the sour cream, sugar, and bourbon (if using) in a bowl, smooth on top of cheesecake, place back into empty roasting pan, and bake for an additional 5-10 minutes. Cover, chill in fridge until cold, at least 4 hours. Remove side of pan and bring to room temperature before serving. Garnish with pecans if desired. do ahead: this cheesecake can be chilled, covered, up to 2 days.